‘Samskrita Vaangmaye Visvakosaah‘ by Sanskrit poet Sri. S. Jagannatha of Mysore is an introduction to the encyclopedic works in Sanskrit literature such as (Raja) Manasollasa of Somesvara, Sivatattvaratnakara of Keladi Basavaraja and Laghusabdasarvasva of Paravastu Venkatarangacharya. The present edition of this book is a revised version of author’s monograph on this subject published by Sri Raghavendra Mutt in Mantralaya in 1909. Jagadvachanavaahinee is an anthology of ‘vachanas’, thought provoking quotations in Sanskrit prose, composed by Sanskrit poet S. Jagannatha of Mysore. The author has composed the vachanas in imitation of the well known vachanas in Kannada mystic literature. Chitritani Chintanani is the Sanskrit rendering of ‘Wrought Intentions’, an anthology of Sanskrit poems by S. Jagannatha translated into Sanskrit by the author himself. The poems are created for those who want fresh air of picturesque themes to be breathed. The poems are accompanied by spontaneous flows of ideas in the form of pictures. Gogitam is a small poem in Sanskrit, based on Govina hadu, story of cow and tiger in Kannada and authored by S.Jagannatha, Maisuru. Original Kannada metre (with rhyme in second letter in each pada) is employed in this poem. 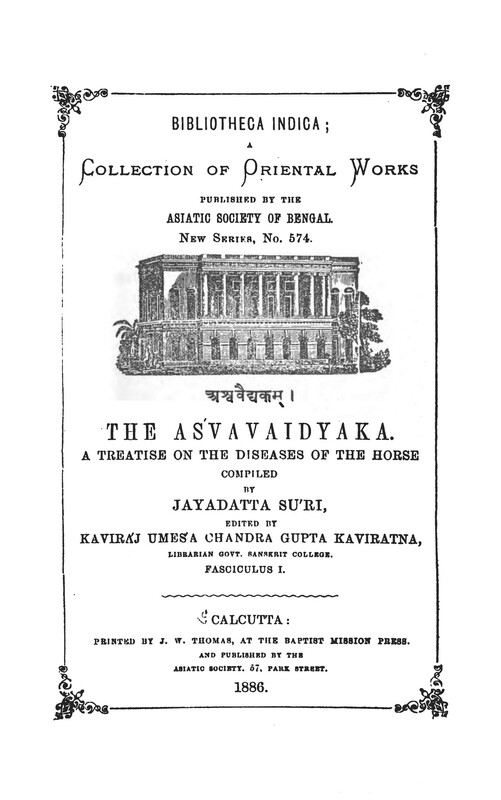 The Bibliotheca Indica, started in 1849 by Royal Asiatic Society, Bengal is perhaps the earliest Indological series. This series consists of a collection of rare and unpublished works belonging to or treating of Oriental literature and contains original text-editions as well as translations into English, and also grammars, dictionaries, bibliographies, and studies. Out of 277 titles published till 1953, only the original texts in Sanskrit, Prakrit and other Indian languages and their translations are included in the following collection. Sanskrit poet and writer S. Jagannatha is indeed familiar to visitors of this blog. His books ‘Astavystam‘, ‘Dve Mukhe‘ and ‘Abhanakajagannatha’ were posted to this blog sometime back. himself. As the author says in his preface, the anthology contains verses on various subjects. The author has provided notes for difficult words. Complete works of Pandit Jibananda Vidyasagara Bhattacharya consist of around 200 texts – some of these were originally written by him while some others were commented, edited and published by him. They cover a wide range of subjects like Vedic literature, Puranas, Tantras, Mimamsa, Nyaya, Vaiseshika, Sankhya, Yoga, Sanskirt Kavyas, Vyakarana, etc. 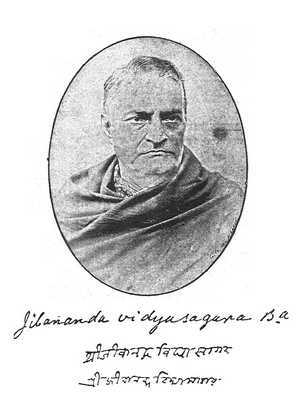 “Paṇḍitakulapati Jīvānanda Vidyāsāgara was born to Śrī Tārānātha Tarkavācaspati Bhaṭṭācārya and Ambikādevī in the year, 1844, on the last day of the Bengali month of Caitra. He studied various subjects like Vyākaraṇa, Sāhitya, Alaṅkāra, Nyāya, Sāṅkhya, Pātañjala, Vedānta, Mīmāṃsā, Jyotiṣa and Smṛti under the tutelage of his father, who was an institution in himself. He earned the prestigious title of “Vidyāsāgara” from the Government Sanskrit College of Calcutta in 1870, and a B.A. from the University of Calcutta. Impressed by his knowledge of various aspects of the Yogaśāstras at the end of a conversation, Mr. Olcott of the Theosophical Society called Vidyāsāgara “Godfather” in 1882. Even during his student days, his enthusiasm for intellectual pursuit was noticeable in the publication of editions of Sanskrit texts. He also started writing his own commentary on such Sanskrit texts at the same time. The subjects he dealt with were as varied as terse Indian philosophy, Sanskrit grammar, classical Sanskrit rhetoric and aesthetics, Sanskrit court-poetry, religious codes (dharmaśāstra), classical Indian medical sciences (Āyurveda), etc. He turned down lucrative job offers from Lahore, Jabbalpore, Jaipur, Nepal, etc. 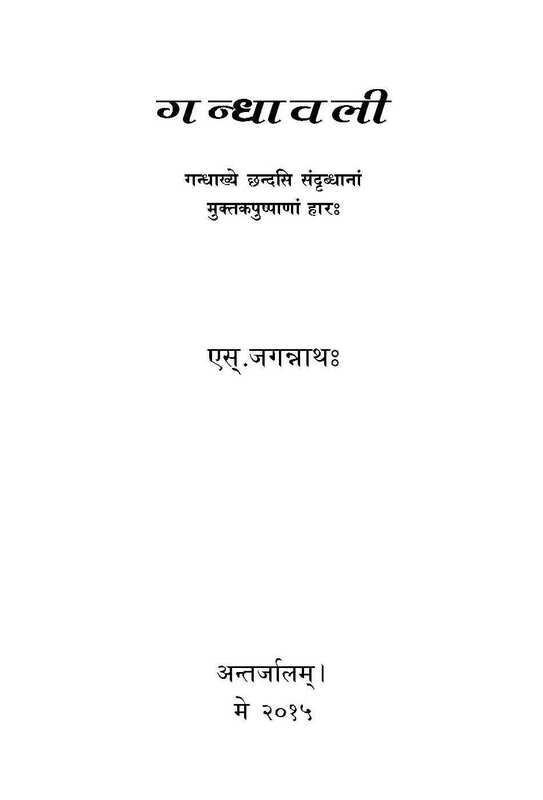 According to Śambhucandra Vidyāratna, Jīvānanda Vidyāsāgara serially published Sanskrit commentaries of his own on 107 Sanskrit works. It took him 22 years to write these commentaries. He wrote a version of the Kathāsaritsāgara in lucid Sanskrit prose in 1400 pages and published it in 1883. He also prepared simpler versions of difficult Sanskrit prose works like Kādambarī of Bāṇabhaṭṭa, Daśakumāracarita of Daṇḍī, etc. He also translated the Tarkasaṅgraha of Annaṃbhaṭṭa into English. His own commentaries on Sanskrit works became so popular in Europe, America, Ceylon, China, Burman, India, etc. that most of these works underwent about 5-6 reprints during his lifetime. Apart from that, he published editions of at least 108 Sanskrit works, some with traditional Sanskrit commentaries. He also ran the free Sanskrit school, started by his father of legendary intellectual fame, and taught students thronging there from various parts of the country. A true polymath, Jīvānanda Vidyāsāgara was survived by his sons, Āśubodha Vidyābhūṣaṇa and Nityabodha Vidyāratna. It is a matter of immense pride for us to present a digital version of the Saralā, a 19th century Sanskrit commentary on the Vaiyākaraṇasiddhāntakaumudī of Bhaṭṭojī Dīkṣita, by Prof. Tārānātha Tarkavācaspati Bhaṭṭācārya of Vācaspatya fame. From Pt. 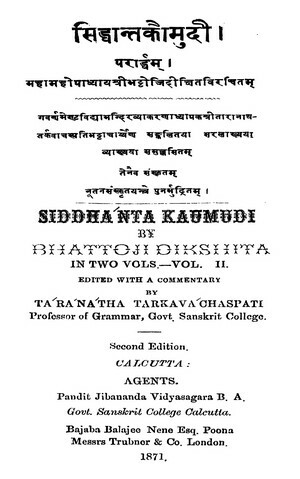 Śambhucandra Vidyāratna’s biography of Tārānātha Tarkavācaspati it appears that it is the first Sanskrit commentary on the Siddhāntakaumudī written by any Bengali scholar. From the same source we learn that this commentary, Saralā, generated professional and academic jealousy even in the minds of contemporary scholars of Pāṇinian grammar residing in Benares, the cultural capital of India, who when asked to compose a like commentary on the Siddhāntakaumudī to discount the uniqueness of the Saralā, remained silent in failure. The authorship of this commentary led to the widespread fame of Tarkvācaspati as an outstanding grammarian of the Pāṇinian School. Also the fact of the running of the Saralā through three editions during the lifetime of Tārānātha Tarkavācaspati legitimates its claim to immense popularity. Thus we earnestly believe that a widespread cultivation of this commentary will immensely benefit students of Pāṇinian grammar all over the world. 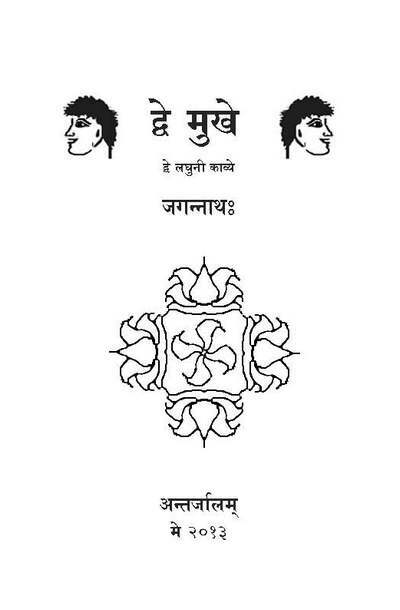 ‘Dve Mukhe’ by S. Jagannatha consists of two short poems in Samskrta namely, Moghaduta (not Meghaduta), a humorous poetry ridiculing love (written in mandakranta metre) and Lokalankara-pankiya, a work of humorous figures of speech containing 112 examples with definitions (written in anustubh metre).